I love looking at maps. Maybe it’s my left-brained attributes taking over yet again, but it’s fun to get a feel for Ulm before we even arrive. Google Earth has allowed me to zoom in and explore our future hometown, so it won’t really feel quite so foreign in those first few days and weeks. Ulm has a lot of the comforts at home, like big department stores (IKEA, Toys ‘R Us) and fast food (McD’s, Burger King, KFC). 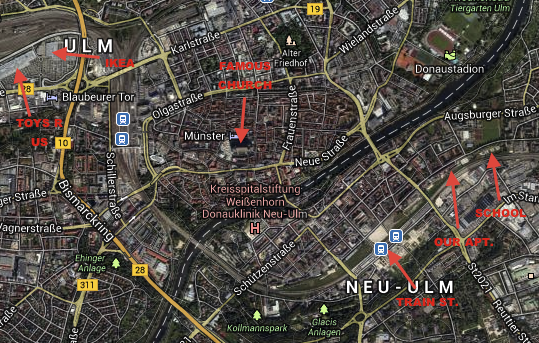 But no Starbucks — the nearest one is in Esslingen an hour away! It seemingly has more than it’s fair share per square kilometer of gyms and dentists…will Germans be even more image conscious than Americans? It has some really great parks and public squares with weekly farmer’s markets, something that is hard to come by in my semi-rural Pacific Northwest region. It’s only a 25-minute drive from Legoland. And it has this: Gummi Bear superstore! Don’t you want to come and visit? Yes, we have seen the spaghetti ice cream, but haven’t bought any yet. The servings are usually huge! Guess we’ll have to give it a try. I’ve seen canned goulash soup in the stores, but haven’t tried that either. Most restaurants don’t seem to offer soup, although now that the weather’s turning colder I wish they did. Thanks Meg & Dave!